© Estate of Jack Keijo Steele. Photograph by R. H. Hensleigh and Tim Thayer. In 1942, the U. S. Navy commissioned the first artists to record the unfolding events of World War II. The Marine Corps Combat Correspondence Program and the Army Art Program, under the auspices of the War Department Art Advisory Committee (WDAAC), soon followed suit. 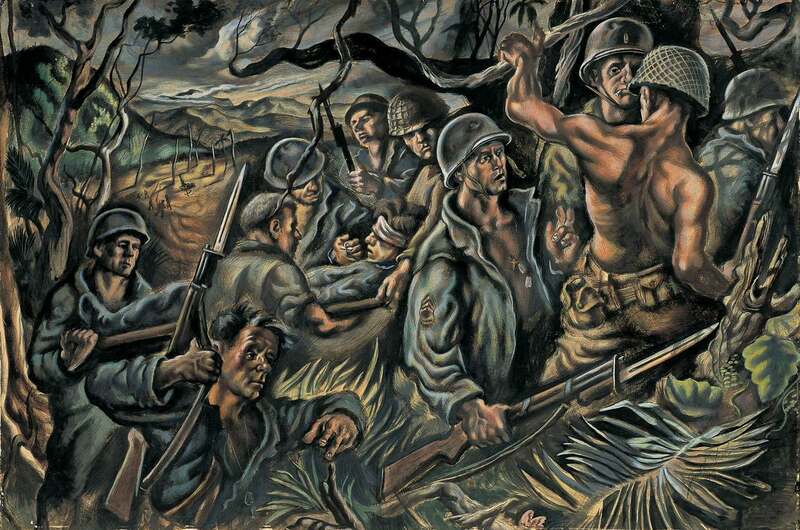 They recruited both enlisted and civilian artists to express the essence of war from a personal point of view. Although the WDAAC lost its federal appropriations in mid-1943, soldier artists continued to document their experience at the front lines through other official channels or as correspondents for the press back home. The War Collection is a rare repository of sketches and paintings by nine Cranbrook Academy of Art students and alumni who served as combat artists in Europe, North Africa, the South Pacific and Australia. Among this elite group was Jack Keijo Steele whose Soldiers in New Guinea recounts a dramatic scene of troops advancing through the unruly bush. Steele depicts this subject with a painterly vigor that verges on abstraction, relating the emotional impact of war as only the artist can convey it.